The Mokgoro Inquiry into the fitness of advocates Nomgcobo Jiba and Lawrence Mrwebi to hold office is continuing with its second day of hearings in Centurion. Retired Constitutional Court Justice Yvonne Mokgoro says bribery allegations levelled against suspended Deputy National Director for Public Prosecutions (NDPP) Nomgcobo Jiba and Special Director of Public Prosecutions Lawrence Mrwebi will, for now, not form part of the inquiry she heads. She said she has not received an affidavit containing the allegations made against them. Mokgoro is heading up an inquiry in Centurion into Jiba and Mrwebi’s fitness to hold office. 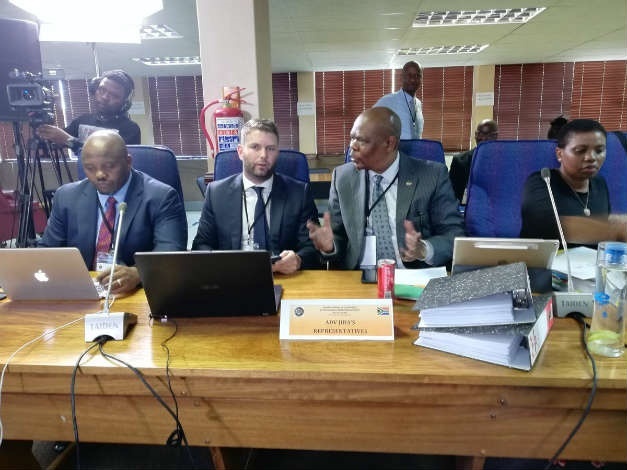 During his testimony at the state capture commission last week, former Bosasa chief operations officer Angelo Agrizzi testified that Jiba received at least R100 000 and Mrwebi R10 000 to kill an ongoing corruption probe by the National Prosecuting Authority (NPA) officials and the Hawks. Is this why Bosasa was never prosecuted? Is anyone surprised that former president Jacob Zuma is expected to be implicated by Angelo Agrizzi in Bosasa’s nest of corruption? I am certainly not. Zuma has showed himself over decades to be a politician for sale. First the Shaiks, then the Guptas and now the Watsons, allegedly. Zuma does not discriminate against any benefactors who are willing to buy his political influence at the right price. The biggest shock for me of the files Agrizzi is reportedly going to drop at the Zondo Commission into state capture over the next few days is the allegation that senior prosecutors were paid to let Bosasa off the hook. A report on whether former deputy prosecutions boss, Nomgcobo Jiba, and her colleague, Lawrence Mrwebi, are fit to hold office will be provided to President Cyril Ramaphosa by no later than March 9, 2019. This is according to a notice published in the Government Gazette. Jiba and Mrwebi were suspended in October after Ramaphosa announced his decision to institute inquiries into their fitness to hold office. Jiba is the Deputy National Director of Public Prosecutions and Mrwebi is the Special Director of Public Prosecutions. The inquiry will provide Ramaphosa with the report, together with all supporting documentation. The Constitutional Court will hear an application by the General Council of the Bar of South Africa (GCB) for leave to appeal a Supreme Court of Appeal (SCA) ruling in favour of suspended deputy prosecutions boss Nomgcobo Jiba and her colleague, Lawrence Mrwebi. The application will be heard on March 14, 2019, the apex court has said. In July, the SCA overturned a ruling of the North Gauteng High Court in Pretoria that Jiba and Mrwebi be struck from the roll of advocates. Deputy prosecutions boss Nomgcobo Jiba has welcomed the opportunity she has been given to give her side of the story after President Cyril Ramaphosa said he intends to institute an inquiry into her fitness to hold office, her lawyer said on Thursday. Ramaphosa announced on Wednesday that he informed Jiba and her colleague, Lawrence Mrwebi, of his decision. “We will abide by the deadline set by the president in terms of making her submissions,” Zola Majavu told News24. “There is absolutely nothing wrong with what the president is doing (giving Jiba an opportunity to make representations). He is simply doing what the court has instructed. Until the president has made his decision, upon receipt of our submission, there will be no commentary on the matter,” Majavu said. The Supreme Court of Appeal has overturned a high court ruling that called for National Prosecuting Authority’s Nomgcobo Jiba and Lawrence Mrwebi to be struck off the roll of advocates. The judgment was delivered by Justice Connie Mocumie in Bloemfontein on Tuesday morning. Jiba and Mrwebi were struck off the roll on September 15, 2016, by Judge Francis Legodi.